by Suzanne Zipperer. Photo by Spencer Chumbley How do you start a neighborhood tradition? Launch it and then hand it over to the pros. That”s just what Jackie Dettloff, Carol Lord andI did last year after the First Annual Riverwest Secret Garden Tour. With aninitial turnout of more than 160 people, we knew the event was well worth doingannually, but weren”t sure who would take the lead. What luck we had – one ofthe couples on the tour not only had the skills, but the enthusiasm for thejob. With a little arm twisting, O.J. Merrell and Chris Renstrom stepped up tothe plate. O.J., retired from 25 years of service as the special eventsand exhibit coordinator at Milwaukee County Zoo, was a natural for organizing. Chris,who has been the graphics coordinator at Alverno College for 27 years, hadalready donated the graphic art for the poster, flyers, and map for the firsttour. The duo loved gardening and talking about the garden of their own. Theywere a perfect fit. O.J., who speaks with a deep voice that he proudly admits he“trained” when he taught theater and voice at Carroll College, took the projecton full force. Before the end of last summer he was out peeking through fencesin alleys. When he spotted a “secret” garden, he’d track the owners down in thecity registry and give them a call. Understandably, some people were leery ofparticipating, not wanting to open their private space to the public. However,his efforts did yield nine new secret gardens and 20 walk-by front yards. While Chris and O.J.’s skill set is important to the tour’ssuccess, just as important is the way they feel about living in Riverwest. At the time they moved, backyards in the neighborhood wereused as thoroughfares, not living spaces. As Chris described it, “Nobody stakedtheir claim. Nobody locked their gates. Nobody said, ‘I don’t want you cuttingthrough my yard.’” The first thing Chris and O.J. did was fence the yard, lockthe gates and claim their space. Today, the hedges and trees they planted havegrown. When you stand in the center of their yard, you stand in a very privatearea. It took an unusually long time for the social couple to meettheir neighbors. “People were walled up in their homes, like in forts,” O.J.explained. A nearby drug house openly did business and calling the police didno good. “People were scared,” he said. Along with the couple, there were ahandful of neighbors who “anchored” themselves to the block and stuck with it. These days, the block has changed. The renter-to-owner ratiohas improved. More owners live in the duplexes or have lived there at sometime. They are also being more careful about who they rent to. The typical backyard of a Riverwest bungalow doesn’t afforda lot of space. Shade from nearby houses can limit sunlight for vegetables. Chrisand O.J. installed those sun-loving plants between garages painted bright whiteand light blue, where the colors reflect the sunlight onto the beds. They alsomounted planters on the side of their garage. The small space yields what theyneed and leaves some to share with neighbors. They say sharing food worksbetter than a block club to connect people. In addition to gardening, O.J. and Chris work on otherprojects together. Stained glass and hand-crafted wooden items adorn theirhouse. O.J. builds guitars. All of this in their little Riverwest bungalow. Neither grew up in Milwaukee. O.J. comes from Oklahoma andChris from Missouri. In Kirksville, Missouri, they met when O.J. was teachingat Truman University and Chris was a student. Years later, they reconnected andare one of those couples who know how to support each other and have fun doingso. Want to meet O.J. and Chris? 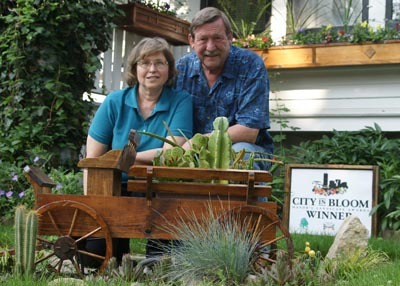 Stop by their garden July 11and thank them on behalf of Riverwest.